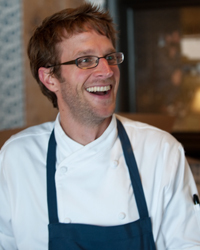 Why He's Amazing: Because he's redefining Nordic cooking in Minnesota with his sophisticated and modern treatment of its humble ingredients. Heritage: He was raised in St. Louis. "My father's side is 100 percent Swedish." On the Bachelor Farmer: "Our food is, first and foremost, representative of where we are, which is Minneapolis, the upper Midwest, but there's a strong Nordic heritage here. [The food is] inspired by Nordic cooking but not necessarily attached to any hard and fast traditions."